The EP2 PosturePod can cater for a variety of builds and sizes. The PosturePod to be adjusted to either small or wide positioning, being particularly effective for multiple users or individuals suffering from particular aliments. The EP2 PosturePod can cater for a variety of builds and sizes. The aluminium base plate allows this PosturePod to be adjusted to either small or wide positioning, being particularly effective for multiple users or individuals suffering from particular aliments. The EP2 can also be re-adjusted after installation. Designed and made in Australia to be used only in conjunction with the GoldTouch keyboard (split keyboard), and numeric pad (separate key pad). The EP2 provides a complete solution for neutral positioning to help prevent common occupational overuse disorders. The angled and adjustable surface of the EP2 promotes a semi-reclined posture also reducing shoulder girdle and arm weight loading on the torso which can help reduce intervertebral disk pressure. Padded foam arm rests provide support for elbows and forearms reducing static muscle strain on upper trapezius and levator scapulae muscles. The arm rests also serve to approximate the arms closer to the torso helping prevent scapular protraction. Shoulders are able to remain in a neutral and relaxed position. Keyboard and mouse recesses reduce wrist extension allowing wrists to remain in a neutral position. 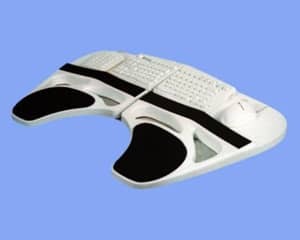 Pressure is redistributed from the undersurface of the wrists to the thena pads helping reduce median nerve compression reducing the risk of Carpel Tunnel Syndrome. This PosturePod provides a complete solution for neutral positioning to help prevent common occupational overuse disorders.